Update 1/7/12: The app dropped its Alpha status and is now available in the Market. Do note, however, that it is good for 14 days, after which you are capped to 20MB of transfer per day unless you unlock the full version (in-app purchase). If it works for you, especially if you're on Verizon and AT&T, the carriers that monitor tether usage, I'm sure you will gladly reward Koush for his efforts. Now, you can find "tethering" gracing many of the reasons to root your Android device articles across the net. But what about users who only want to tether and aren't confortable with rooting (or otherwise have no desire to gain root access)? Enter a new app from Koush, the mind behind some of the most important apps on Android, like ClockworkMod Recovery and ROM Manager. This new app, called ClockworkMod Tether, will allow users to bypass carrier tethering restrictions without root access. This is a USB tethering solution and also requires a virtual network adapter to be installed on any computer (it's Mac, Windows, and Linux compatible) in which tethering will be used (also provided by Koush). 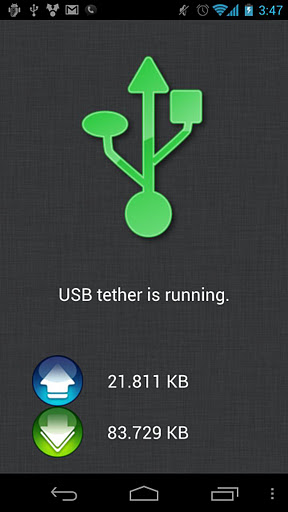 At the current time, ClockworkMod Tether is still in its alpha stages, and as a result, Koush is asking for user feedback on the apps ease of setup and use, as well as how well it functioned during use. If you're ready to give it a shot, head over to this Google+ posting to grab the download and give it a shot! Update: Use the widget below instead.